Blending a dark, dramatic finish with sleek, clean lines, the black Shay corner TV stand brings a highly contemporary vibe into your living space. A warm undertone of merlot and an elegantly curved rail base keep the look sharp, not stark. Roomy open cubby and adjustable shelving are right in tune with today’s media equipment setups. 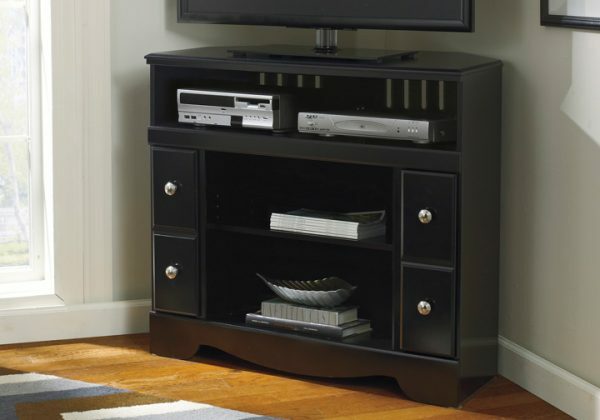 The Shay Black Entertainment Series by Ashley features black finish with a merlot color undercoat. Blocky details throughout this generously scaled collection. Contemporary satin nickel color knobs. Swooping shaped base rail. W271-68 has side roller glides for smooth operating drawers. The lighted tall pier features glass shelves. The W271-12 and W271-68 are compatible with the W100-01,02 LED fireplace insert. W271-12 and W271-68 are compatible with the W100-41 Integrated Audio.